Most ancient cultures used the seemingly magical power of sound to heal. Sound healing had almost disappeared in the West until the 1930s when acoustic researchers discovered ultrasound and its medical properties. With this discovery, research burgeoned and today the ancient art of sound healing is rapidly developing into a new science. There is now a mass of research into the healing benefits of ultrasound, including its use in breaking up kidney stones and even shrinking tumours. [1-3] In addition, infrasound and audible sound are now recognized as having immense healing properties. The Aboriginal people of Australia are the first known culture to heal with sound. Their 'yidaki' (modern name, didgeridoo) has been used as a healing tool for at least 40,000 years. The Aborigines healed broken bones, muscle tears and illnesses of every kind using their enigmatic musical instrument. Interestingly, the sounds emitted by the yidaki are in alignment with modern sound healing technology. It is becoming apparent that the wisdom of the ancients was based on 'sound' principles. The healing chapel at Deir el-Bahari, Thebes, was dedicated to Amenhotep-son-of-Hapu, a deified healing saint closely associated with 'Imhotep' who is largely recognized under the title of 'physician.' Imhotep's repute was so tremendous that, 1,500 years after his death, the Greeks identified him with their healing god Asclepius. These two deified men 'Amenhotep-son-of-Hapu and Imhotep' were usually worshipped together in the same Egyptian healing temples. My acoustics research in the pyramids has provided strong evidence that the Egyptians designed their chapels and burial chambers to be reverberant in order to enhance ritualistic chant. (See Egyptology section of this web site.) It is, therefore, very likely that the ancient Egyptians were aware of the healing properties of sound long before the Greeks. Pythagoras (circa 500 BC) is credited as being the first person to use ''music as medicine.'' The flute and the lyre were two of the primary instruments used by Pythagoras and his followers for healing purposes. He is also credited with being the first to understand musical intervals from his work with the monochord, a single-stringed instrument in which the string tension was established by a fixed weight. In the Greco-Roman period healing temples were used for 'incubation' a process in which patients underwent 'dream sleep, among other known modalities. It seems likely that music was used therapeutically during their stay and the reverberant spaces of the temples enhanced the efficiency of acoustic instruments, a function of the solid stonewalls of temples and sanatoria. In 1938 another German scientist, Raimar Pohlman, demonstrated ultrasound' therapeutic properties in a Berlin physiotherapy clinic. By the 1950' ultrasound had become a widely used sound healing modality. Even to this day the underlying healing mechanism is not fully understood. Cymatherapy International bought the rights for the technology from Manners and now manufactures the Cymatherapy machine in the USA. Their version uses advanced computers to create ultra pure tones, mostly in sets of five. It has 700 'codes'that address a huge range of injuries and ailments. There are many other sound healing modalities currently entering the market place, including personal therapeutic ultrasound units manufactured in the Far East, many of which find their way into people's homes. All cells emit sound as a consequence of their metabolic processes. There is an interaction between the cells own sounds and those imposed by the environment, including those applied by sound healing devices. 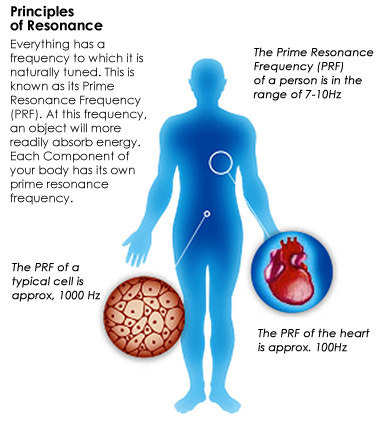 The resonance principle relates to the cellular absorption of the healing sounds and/or their harmonics. In sound healing, resonance principles are employed to re-harmonize cells that have been (hypothetically) imprinted with disruptive frequencies. Such troublesome imprints may have been a result of toxic substances, emotional traumas, pathogens, or long-term exposure to noise pollution. Another possible explanation of how sound is able to trigger the healing response relates to cellular ion channels. Situated within a cell's membrane, ion channels are the means by which the cell receives nourishment and communicates with neighboring cells. In dysfunctional cells it is proposed that some of these vital channels are shut down causing cell senescence �literally the cell is sleeping. In this hypothesis, sound opens the closed channels, supporting the cell to awaken and resume normal functioning and replication. Dr James Gimzewski, of UCLA, California, has taken a revolutionary approach to studying cellular function. He uses an atomic force microscope, a kind of super-sensitive microphone, to listen to the sounds emitted by cells. The focus of this new science, called 'sonocytology', is mapping the pulsations of the cell outer membrane, thus identifying the 'song' of the cell. Gimzewski's work has revealed that every cell in our bodies has a unique sonic signature and 'sings' to its neighbours. Sonocytology is a potentially powerful, diagnostic tool for identifying the sounds of healthy cells versus those of injurious ones. But it introduces an even more exciting prospect: the ability to play the destructive sounds of rogue cells back to them greatly amplified, so that they implode and are destroyed. In this scenario there would be no collateral damage to surrounding tissue since healthy cells would not resonate with these frequencies. Other related research (Weisenfield and Moss, 1995) concerns cellular emission of biophotons. Intrinsic random noise, created by the activity of membrane ion channels, may be entrained by incoming weak electromagnetic fields to create cell signals that harmonize with the incoming frequency. 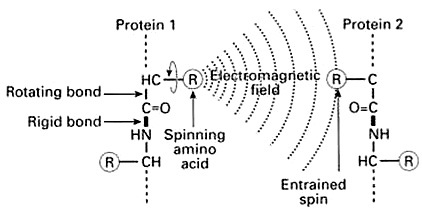 This effect is known as ''stochastic resonance'' and can have positive effects on cell function. Apart from the employment of sound healing devices the healing response can be triggered by the application of electromagnetism to the affected body part. There are many such modalities currently in use, including shortwave diathermy and microwave diathermy. Sound is a highly effective tool for healing and, fortunately, an individual does not need to believe in it for it to work. However, there is another factor that can greatly amplify the effectiveness of healing: creative intention. It may be a long time before mainstream medicine recognizes the importance of intention. In contrast, most vibrational energy practitioners, including sound healing therapists, use a holistic approach that addresses both mind and body. When the power of intention is held, the chances of a successful outcome are greatly intensified. Intention consists of using your focused thoughts, feelings and visualizations to attract whatever is desired, such as enhancing one's health. It seems possible that the energy of intention is carried on the frequencies of sound. American sound healer, Dr Steven Halpern, believes that, ''Sound is a carrier wave of consciousness.'' One's intention is the spiritual counterpart of the sound and the combination of sound and intention create the outcome of healing. When using creative intention, there is the sense of being deeply inspired. (The word inspiration means in-spirit.) We are motivated to respond to a deeper calling with a firm belief, an absolute knowing, that our desire has already been fulfilled. When we merge the mind energizing force with the universal field of energy for the purpose of healing and creation, our health and the quality of our lives can be transformed. It is highly beneficial to the creative process when you act as if you already have what you want. See, feel, and think as if your body is currently vital and whole. When you act as if your desired outcome has already happened, the subconscious mind cannot differentiate between what is factual and what is imagined and believes your intention is actual reality. The mind holds immense healing and creative powers and will continue to work on your behalf as long as you maintain your conscious focus of intention. Perhaps the most important element in 'acting as if' is to feel the experience of having already manifested your desire. Buried fear-based issues and limiting beliefs tend to set up an internal conflict. The conscious mind may want to create a desired outcome, but the overpowering, conflicting influence of unresolved issues and beliefs block success. Nothing can become a part of your reality unless your feelings and your conscious mind are in alignment with the more powerful subconscious mind. Many effective vibrational healing modalities are available to resolve these blocks to well-being and success. The magnificent power of intention fully engages when all systems are in alliance, when the thinking-feeling self aligns with the underlying belief system. Operating on the premise that sound is holographic, sound patterns are predicted to occur at all scales and on all shapes of membrane, whether circular, spherical or irregular. While surface tension characteristics on cell membranes are likely to be very different than those employed in the CymaScope (i.e. the surface tension of water) the principles remain the same.